• Built-in busy light silently alerts others that you are on the phone. • Single earpiece leaves the other ear free. • Soft, cushioned leatherette earpiece is super-comfortable. • Long-lasting metal, adjustable headpiece. 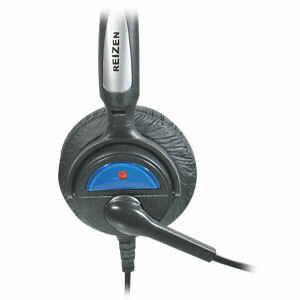 This top quality headset offers all-day comfort and superior sound quality. With its comfortable, lightweight over-the-head single leatherette earpiece design with Quick Disconnect feature, this headset will more than fill your office needs. The microphone boom is able to rotate to accomodate either the left or the right ear. The noise-canceling microphone reduces surrounding background noise while giving you crystal clear phone calls. With the deluxe, built-in busy light, this headset silently alerts others that you are on the phone. The headset is a lightweight, comfortable design that adjusts for a variety of head sizes with a comfortable leatherette ear cushion that makes wearing these headsets for long periods of time, a pleasure. Comes complete with a tangle-free coiled cord and shirt clip. This cord has the Quick Disconnect option which lets you walk away from the phone while still wearing the headset. Uses a standard phone RJ-11 modular plug. Covered under a 1-year mfg. warranty.